With the advancement of technology man is becoming lazier and lazier everyday. There was a time when I used to come home from school, take a bath, change my clothes and go out to play cricket with my friends. I used to be brisk and hyper active. But these days , the story has changed. I come home and land in the couch and reach for the remote control and just lie there and watch TV till dinner time. Most of the time I wouldn't even remove my socks. Even when I use the laptop, I used to lie down on the bed and write blog posts. Then one day I saw that a man died because of using laptops in bed. Then I stopped using lap tops in bed. But still I am lazy. Every payment transaction is done online these days. Yes it saves time. It also makes us lazy. We don't have to stand in queues in banks and we don't have to stand in queue to pay electricity bills. There are lazy people in each and every field. In Cricket, the laziest batsman I have ever seen is Inzamam Ul Haq. How many times we would have seen him running himself out. It all started with the famous Flying Johnty dismissal. Then it became an every day affair with Inzamam. How can we forget Arjuna Ranatunga, who had great difficulty in running between the wickets. He invented the walking between the wicket syndrome. 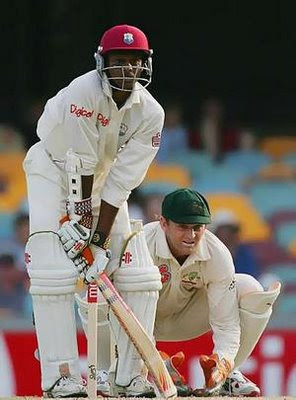 If Inzy and Ranatunga are alow runners between the wickets, Chanderpaul is a slow stander in front of the wicket. His stance is as though he has just recovered from a piles operation. He stretches his legs so wide and one whole family can sit between his legs and finish dinner while he bats. My European friend Steve is so lazy to stand and pee. 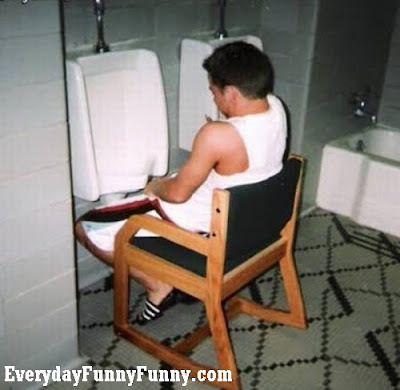 Hence he has placed a chair in his loo. He performs the Volcano by sitting in his chair. I am very lazy to complete this post. Right now I am so lazy like the guy who designed the Japanese flag. Have you come across any Lazy people in your life? Tell us about them. "whole family can sit between his legs and finish dinner while he bats"